Adding Roasted Red Pepper Hummus next! Lunch: Turkey Bacon, Fresh Mozzarella & Hummus Wrap! Note: This is one of those meals that comes together when I need to clean out the fridge! I have lots of little bits of things left in containers and it typically can all go together into a salad or wrap like this!! This particular sandwich was a bit messy, I ended up eating it with a knife and fork - apparently 1 sauce is enough for a wrap! Spinach Puree Recipe: I put a couple handfuls of fresh baby Spinach into my food processor and drizzled EVOO in while it was processing. Voila! Now I have a handy container in the fridge so I can easily add it to things, like Wrap, Salad Dressings, Pasta, Veggies OR my kids fav "GREEN" Organic Macaroni & Cheese with Kidney Beans! 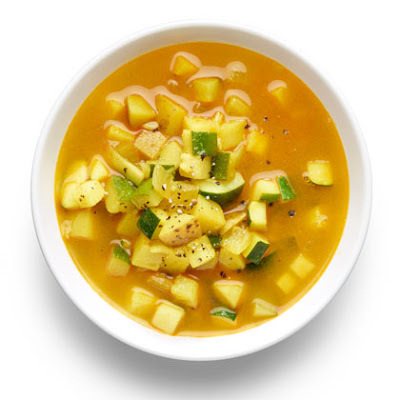 My version of the Mariel Zagunis Hearty Zucchini Soup! Recipe for soup at link in Daily Tidbit, plus 1 Can of Cannellini beans, drained and rinsed, and cut up Cilantro & fresh Lemon Juice.